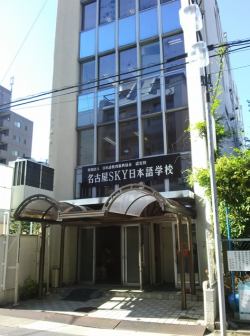 Nagoya SKY Japanese Language school is located in Shin-Sakae area in the Naka ward, which is the heart of Nagoya city. Nagoya city is the third largest urban city located in the center of Japan. It is about halfway between Tokyo and Osaka, and is also one of a famous education area in which many schools are located. It is dotted with historical spots cultural assets. There are many useful sites around out school such as a library and an art museum- it is ideal environment for study. Moreover, Shin-Sakae is a very urban area. You can walk from our school to the supermarket, many convenience stores, big department stores, a general hospital, ward office, and so on. It takes only a few minutes on foot. Excellent Teachers: All the teachers in Nagoya SKY meet the standard required by The Association for the Promotion of Japanese Language Education and have knowledge and skills. The teachers have enough career to teach therefore students can learn Japanese efficiently. 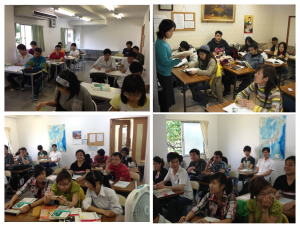 Specialised Lessons For JLPT And EJU Exams: We have specialized lessons for preparation for JLPT and EJU exam in the general Japanese lessons. Counselling: Student advisers who are fluent in foreign languages counsel students’ several problems. We investigate the students’ Japanese level to arrange their class with the test and the interview before the new semester starts. Therefore students can improve their language skills comfortably. We hold various events such as a speech competition, a calligraphy convention, visits to a companies and universities, and school trips to experience Japanese culture. The tuition and fees of Nagoya SKY Japanese Language School are as follows. Here is the estimated cost for one academic year at Nagoya SKY Japanese Language School. It is based on dormitory (25,000 yen/month). The estimated cost will be changed depending on how you stay.